Martha’s Song is a charity that assist Robertson county residents with cancer needs not covered by insurance. This fashion show is our big fundraiser that we do every other year. 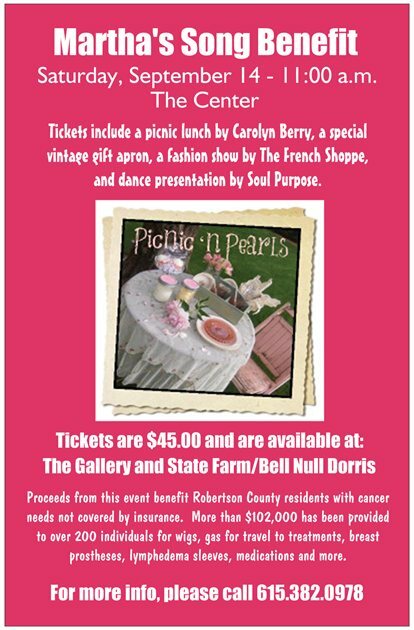 The cost of a ticket is $45.00 and includes a picnic lunch catered by Carolyn Berry that would make your grandma proud, a special vintage gift apron, a fashion show by The French Shoppe, a picnic-inspired dance presentation by Soul Purpose, and all the sweet tea you can hold! After lunch, you will have the opportunity to purchase the clothing, jewelry and more with a percentage of the proceeds benefiting Martha’s Song. So don those pearls, and come lunch with us! You may purchase your ticket at The Gallery, State Farm/Beth Null Dorris office or through The NorthCrest Foundation – simply mail your check to Martha’s Song / 100 NorthCrest Drive / Springfield, TN 37172. Or, you may purchase your ticket online by logging online – For more info or for sponsorship opportunities, call 615.382-0978. Martha’s Song was originally organized to honor a very special woman, Martha Parker, who willingly donated hundreds of hours of time to help citizens in our county. This fund has currently provided benefits to more than 200 residents of Robertson County who have been diagnosed with cancer. With generous contributions, this program has provided $102,000 to cancer patients for breast prostheses, lymphedema sleeves, wigs, gas for travel to treatments, medication, nutritional drinks and more.